Today was our original departure day. But today we went to work, the boat is in the yard, and the propeller is sitting on the living room floor (meaning we still have a living room). Obviously, we have not departed. This is OK, because our original plan was to only go cruising for one year. After our last shake down to the Abacos and meeting a couple that peaked our interest in the San Blas islands of Panama, we decided we needed more time to see all the places we wanted to see. We were already making the big commitments of selling the house, cars, and quitting our jobs…..might as well make it truly worth it. So after some number crunching and budget stretching we pushed back our departure date to after hurricane season and extended our cruise from just the Bahamas to possibly an entire caribbean circuit. 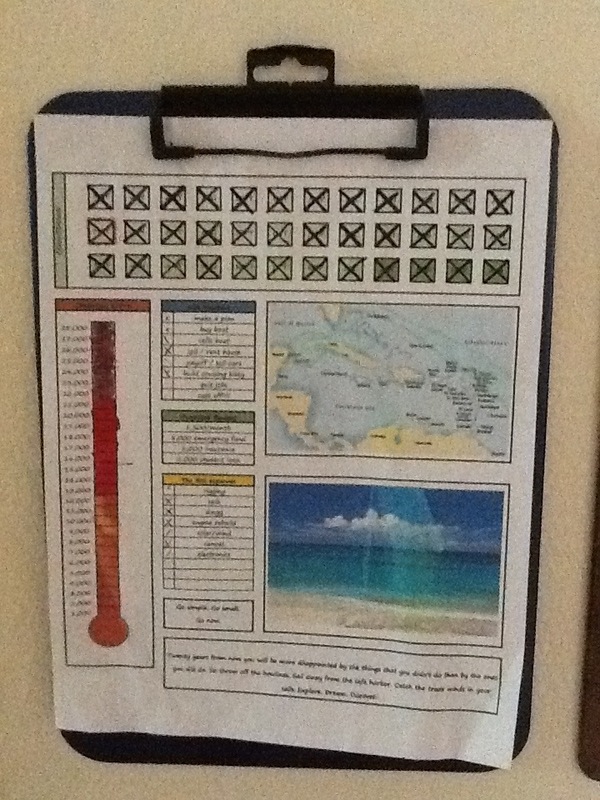 When we first finalized our one-year cruising plans three years ago, I made a one-page goal/inspiration worksheet. It’s intention was to keep our focus on the big picture and completing our biggest tasks without getting lost in the long todo lists and wrapped up in purchasing unnecessary items. At the top is a square to countdown each month, at first they get crossed off real slow but they build up momentum and check marks are flying now. Along the side is a thermometer graph and as we saved money we colored in the marks. I made only two simple checklist that had our needs boiled down to the essentials. One is for what we had to do: make a plan, buy a boat, refit boat, sell house, sell cars, save money, quit jobs, cast off!! (easy-the first two were already done!) The other list is for expensive items to buy: rigging, new sails, dingys/outboards, engine rebuild, solar panels, canvas, electronics. I also included a chart of where we want to go, a inspirational photo, two quotes, and an outline of our projected cruising budget. This little piece of paper has kept us focused and on goal the past few years. We have looked at it several times a day (it has been on our fridge) and never went more than a few weeks without checking something off of it. In fact we would have easily been able to leave today had we not extended our plans. I am not making a new one for our departure in fall, but instead leaving this one hanging up to remind us that it is time to go! Hurry up and finish the details, cram some more money away and leave as soon as the big storms do.